If you’re blessed with long, voluminous lashes, then you probably cannot relate, but the rest of us are always on the hunt for an eyelash glue that’ll make putting on false lashes less of a struggle. It’s not only hard to find any good ones, it’s hard to find any at all, as there aren’t that many lash glues or eyelash adhesives available in India. Despite the lack of variety though, it can still be difficult to choose a lash adhesive, as it’s hard to tell what makes each of them different. 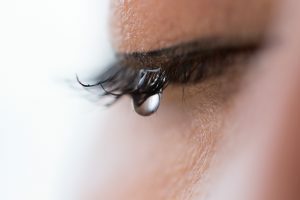 Therefore, in this article, we will discuss all the factors you need to consider when you’re choosing an eyelash glue, and also give you a list of the top 5 best ones you can find online. Let us start with all the aspects you need to look at if you want to choose the best lash glue and save yourself both time as well as effort. Rather than merely looking at what the lash glue looks like when it’s wet, you need to think about what it looks like once it dries. Lash adhesives usually dry down to either a transparent shade, or an almost black shade, and each of them has their own pros and cons. Those who prefer wearing brown or other coloured lashes without any black eyeliner should choose clear glue, as it won’t end up looking off against those shades. Clear glue looks clear or white in the bottle, but always dries down transparent, which is why it’s recommended for beginners too, as it’s much easier to correct mistakes. Although it looks transparent once it has dried, it’s not exactly matte, so it’s still visible if you’re looking closely. Hence, we would suggest using a bit of eye shadow to make it less apparent and blend it in with the rest of your makeup. Depending on the formulation, it may leave white bits along the lash line, so make sure your cover those too. Black eyelash adhesive is the one you should get if you only ever wear black lashes and liner because it’ll blend right in and not look odd. It can often appear greyish when it’s wet, but once it dries down, it becomes proper black, so it won’t disturb the rest of your makeup. You have to be more careful while using this though, applying just enough so it won’t spread too much and force you to go for a thicker liner. 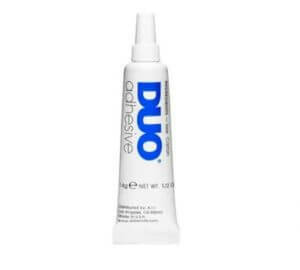 It’s recommended for people who have some experience using lash glues though because it’s not easy to clean up mistakes made with this. There are two types of applicators you’ll find, brush type and tube type, so when you’re choosing a lash adhesive for yourself, you need to consider which type of applicator suits your needs. This is the type of applicator we’d recommend if you prefer to apply a layer of lash glue not only to the lash strip but directly along the lash line as well. Brush types give you more control and precision, which is why they work well for direct application, and also for those who lack enough practice to use the other type. If you only like to use lash glue along the lash strip, and not along the lash line, then tube type applicators would be great for you. Although, they’re a bit harder to use, so we would recommend these to those who actually have experience using them unless the glue is not too expensive and you’re trying to practice using this type. The trick to finding lash glues that’ll keep your lashes on for more than 8 hours is to go for glues with waterproof formulations. They may have a bad reputation for being hard to remove, but they’ll keep your falsies on even through a sob session, so if you need a long wearing glue, this is the type of formula you need to look for. As for removing them, all you need to do is invest in an eye makeup remover, instead of only using a makeup remover, and then double cleansing. Another piece of advice would be to use a warm towel on your eyes to loosen the glue before you start washing, and that’s all it takes. Now that we’re done discussing how you should go about choosing a lash glue, let us introduce you to the top 5 best eyelash glue you can find online in India. 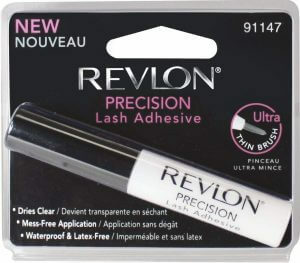 Those looking for an affordable, black lash glue with a brush applicator should go for this one. It’s easy to use, making it great for those who’ve just recently started using fake eyelashes, and since it’s not expensive either, you can use it to practice. It’s also great to travel with, and you can keep it in your bag for emergency fixes. It’s not the most long-lasting formula though, so if you need something that’ll hold your lashes for long hours, then this isn’t right for you. Furthermore, the bottle is quite small and the glue dries up fairly easily, so even if you don’t use it as often, you’ll run out of it within a month or two of opening it. 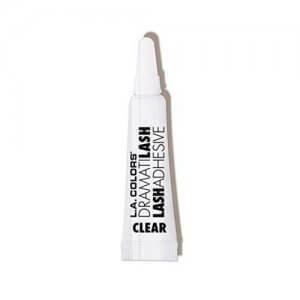 This tube type clear lash glue is great for people who’re used to wearing fake eyelashes and need something that’ll make sure their falsies stay on for at least 8 hours. It dries within 20 seconds, so you don’t need to spend too long waiting, and a little goes a long way with this lash glue, so it won’t run out quickly either. Since it is pretty expensive, we do not recommend getting this for practice, and we’d also suggest those with sensitive skin or sensitive eyes to consider one of the other products because the formulation for this one isn’t gentle enough. Additionally, it doesn’t dry down quite as clear, so you’ll need to fix a few spots with a liner. If you’re looking for a lash glue that is easy to use even when you’re trying to get your lashes on in a hurry, then this is the one for you. It is not too watery, giving you more precision, and although it looks white when it’s wet, it dries transparent, without the distinctly visible shiny white bits that most clear lash glues leave you with. It does not irritate sensitive skin or sensitive eyes, so you needn’t worry about that either. 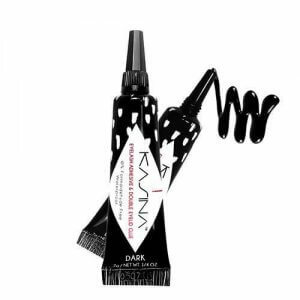 While it is really expensive, it is definitely worth the investment, as it’ll hold for more than 15 hours without the need for any fixing, and you could cry your heart out while wearing fake lashes, but they will not budge if you’ve used this glue. 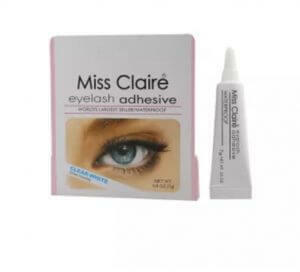 Those looking for a clear, tube type lash glue with an economical price tag should go for this one. Although it looks white when you’re applying it, it dries down completely transparent, and all you need to do is matte down the shiny finish. It’s also great for beginners who’re trying to learn how to use a tube type glue. It doesn’t take too long to dry down either, you only need to wait for about 20 seconds, before you can put the lashes on. Furthermore, it’s not hard to remove either, so as long as you have a good eye makeup remover, you won’t have to fight with your falsies at the end of the day to get them off. 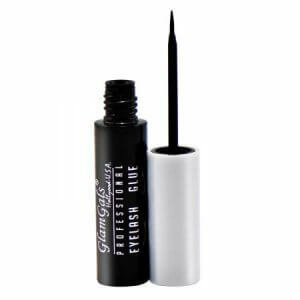 The best eyelash glue on the market, this looks greyish when it’s wet, and dries down to a blue-black, blending in perfectly with black lashes and black liner. Despite being a dark lash glue in a tube, it is not difficult to use, and even those who’re not used to wearing false lashes can get used to this quickly. Not only is it easy to use, but it’s also easy to remove, and that’s pretty incredible, considering it has a really strong hold which keeps the lashes on for almost 12 hours. In addition to all of that, it’s also one of the most affordable options out there, so you don’t need to burn a whole in your pocket to get it either. There is a lot of a variety when it comes to false lashes, but it’s not the same when it comes to lash glues. There is also a lack of information about these tiny products, so even when you want to know more about them, it can be quite hard to do so. 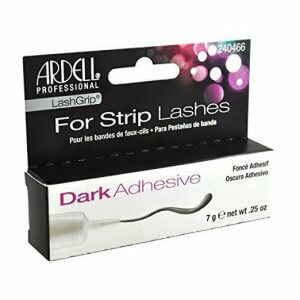 We hope our article was able to fill this gap and you now feel more prepared to buy a lash adhesive. We also hope that our list of recommended products helped make the decision easier for you and you were able to choose the best lash glue for yourself.